Size of Male: 45-65 lbs., 22-25 in. Size of Female: 45-65 lbs., 20-23 in. 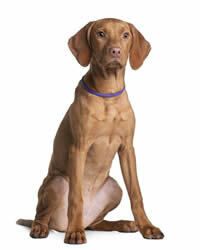 The Hungarian Vizsla exhibits dual characteristics, combining those of retrievers and pointers. Not just a hunting dog, the affectionate and companionable pooch makes a wonderful family pet, too. A rusty golden coat makes these athletic dogs easy to spot. If you ask a couple of registries, however, you will be told that the smooth-haired and wire-haired dogs are two distinct breeds. In Hungarian tongue, Vizsla literally means “responsive” and “alert.” The origins of the breed are not really clear. One theory suggests that these dogs once served as the hunting companions of the Magyar hordes. You will catch a glimpse of the dogs etched in art works dating back to the 10th century – a period when they became a hugely favored breed of warlords and barons alike. Another theory suggests that this sporting dog resulted from a series of breeding experiments that involved various pointer dogs. There came a time that this dog breed became almost extinct. Luckily, they survived World War II. Some of the dogs were able to enter America in the mid-20th century. Today, they continue to grow in numbers and in popularity. This energetic breed can actually be quite mild mannered and affectionate. The dogs are quick to get attached to their owner and may resort to destructive chewing if you don’t give them the attention that they require. Generally, they sport an overprotective and endearing streak, quick to bark warnings but friendly to visitors. If you are an outgoing person, you may have found your perfect companion. Living Environment – These dogs are born hunters. They require a huge yard to romp about and engage in strenuous physical activities. Although they may adore you and find comfort in your company, these dogs will be unhappy if you keep them in a cramped apartment. They are less tolerant to the cold as they are to heat. Grooming – This dog breed has short and coarse hair that is easy to comb, making for minimal grooming requirements. Use a brush with stiff bristles and remember to use mild shampoo or soap only during baths. Diet & Exercise – Given the breed’s boundless energy, this Hungarian pointer’s dietary needs involve frequent but average-sized feedings. Experts suggest 2 feedings a day on the average. Each feeding usually consists of 2 cups of fresh food or high-quality kibble. Swimming and off-leash playing are the best ways to satiate the breed’s desire to move about. Address your pet’s exercise needs adequately and you’ll have a well-behaved dog to enjoy. Designate 30 minutes to a full hour of exercises every day for your pet. Health – This breed will succumb to a number of health concerns, including hip disorders, hemophilia, chronic heart disease, cancer and epilepsy. The breed is also sensitive to cold temperatures. Obedience training and socialization are crucial for the breed, and you must start early. Vizslas are moderately trainable, but with the right leader to guide them, they can stand out in competitive obedience routines. They are challenging to housebreak. The dog tends to be sensitive, so do not use physical force and harsh admonishments during the training.